How important commemoration at the Liturgy is may be seen in the following occurrence: Before the uncovering of the relics of St. Theodosius of Chernigov (1896), the priest-monk (the renowned Starets Alexis of Goloseyevsky Hermitage, of the Kiev-Caves Lavra, who died in 1916) who was conducting the re-vesting of the relics, becoming weary while sitting by the relics, dozed off and saw before him the Saint, who told him: "I thank you for laboring me. I beg you also, when you will serve the Liturgy, to commemorate my parents"—and be gave their names (Priest Nikita and Maria). ** "How can you, O Saint, ask my prayers, when you yourself stand at the heavenly Throne and grant to people God's mercy?" the priest-monk asked. "Yes, that is true," replied St. Theodosius, "but the offering at the Liturgy is more powerful than my prayer." Therefore, we see panikhidas and prayer at home for the dead are beneficial for them, as are good deeds done in their memory, such as alms or contributions to the church. But especially beneficial for them is commemoration at the Divine Liturgy. There have been many appearances of the dead and other occurrences which confirm how beneficial is the commemoration of the dead. Many who died in repentance, but who were unable to manifest this while they were alive, have been freed from tortures and have obtained repose. 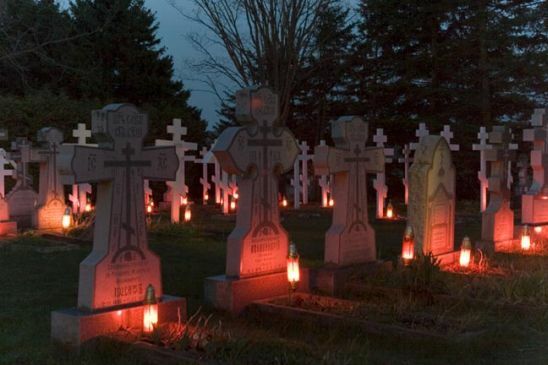 In the Church, prayers are ever offered for the repose of the dead, and on the day of the Descent of the Holy Spirit, in the kneeling prayers at vespers, there is even a special petition "for those in hell." St. Gregory the Great, in answering in his Dialogues the question, "Is there anything at all that can possibly benefit souls after death?" teaches: "The Holy Sacrifice of Christ, our saving Victim, brings great benefits to souls even after death, provided their sins (are such as) can be pardoned in the life to come. For this reason the souls of the dead sometimes beg to have Liturgies offered for them ... The safer course, naturally, is to do for ourselves during life what we hope others will do for us after death. It is better to make one's exit a free man than to seek liberty after one is in chains. We should, therefore, despise this world with all our hearts as though its glory were already spent, and offer our sacrifice of tears to God each day as we immolate His sacred Flesh and Blood. This Sacrifice alone has the power of saving the soul from eternal death, for it presents to us mystically the death of the Only-begotten Son" (Dialogues IV: 57, 60, pp. 266, 272-3). St. Gregory gives several examples of the dead appearing to the living and asking for or thanking them for the celebration of the Liturgy for their repose; once, also, a captive whom his wife believed dead and for whom she had the Liturgy celebrated on certain days, returned from captivity and told her how he had been released from his chains on some days—the very days when the Liturgy had been offered for him. (Dialogues IV: 57, 59, pp. 267, 270). Protestant theologians find the Church's prayer for the dead to be somehow incompatible with the necessity of finding salvation first of all in this life: "If you can be saved by the Church after death, then why bother to struggle or find faith in this Life? Let us eat, drink, and be merry..." Of course, no one holding such a philosophy has ever attained salvation by the Church's prayers, and it is evident that such an argument is quite artificial and even hypocritical. The Church's prayer cannot save anyone who does not wish salvation, or who never offered any struggle for it himself during his lifetime. In a sense, one might say that the prayer of the Church or of individual Christians for a dead person is but another result of that person's life: he would not be prayed for unless he had done something during his lifetime to inspire such prayer after his death. St. Mark of Ephesus also discusses this question of the Church's prayer for the dead and the improvement it brings in their state, citing the example of the prayer of St. Gregory the Dialogist for the Roman Emperor Trajan—a prayer inspired by a good deed of this pagan Emperor. **These names had been unknown before this vision. Several years after the canonization, St. Theodosius' own Book of Commemoration was found in the monastery where he had once been Abbot, which confirmed these names and corroborated the vision. See the Life of Elder Alexis in Pravoslavny Blagovestnik, San Francisco, 1967, No. I (in Russian).